In one of the grosser and most direct examples of market manipulation, central banks have quite directly prohibited stock markets from correcting to any serious degree. QE buying and buying and buying has propped up these ugly-fundamentals markets for years now. So why not buy stocks and keep playing this parlor game right alongside the CBs? Because they’re not buying anymore. Central banks are net sellers. The Fed is attempting to actively unwind their QE-bloated balance sheet. 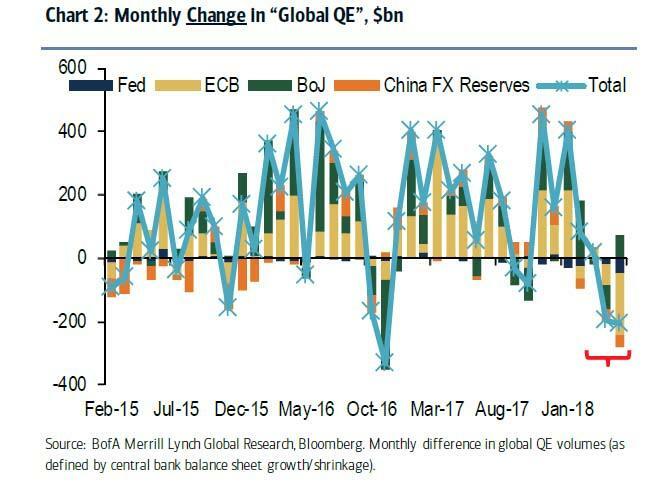 The combination of central banks no longer literally forbidding the markets from falling much, the overall lack of liquidity due to machines taking the place of human market makers, and trading algorithms all trying to sell at once in the face of the next serious negative headline, is the stuff of broken-market nightmares. Back in the dinosaur days of 1987, there was no Internet. There was no instant trading. People called brokers, who then placed trades. So when the market crashed, sellers were met with busy signals and endlessly ringing phones. Those “lucky” enough to get through tried to place orders several dollars below the last known price, only to sometimes find that there were no buy orders. It was true chaos. What evolved over the course of a morning in 1987 could happen in moments today. Significantly higher pricing transparency instills a false sense of confidence. But with little regulation and the vast majority of trading volume generated by unreasoning quant equations that will engage in a microsecond race to the exit door at once, we are one breathtaking moment away from a truly broken market. Then what? Anyone’s guess. But if you’re long in a market that definitively breaks, you’re completely vulnerable to the whims of those in charge of that market. How they choose to solve/halt/unhalt/unwind will remain to be seen. The one guarantee? It will benefit big banks, and in the zero-sum game of trading, that benefit will come at the expense of everyone else who lacked the foresight to get out of that market while they still could. Everything trades at dislocated prices relative to the NBBO, and everyone—justifiably—widens their spreads. That happens almost every time there’s volatility, largely because message traffic increases dramatically. This is due to the fact that the opportunity set is greater and there’s no economic disincentive for sending messages to the market, so more electronic orders come in. This slows the system, widening spreads and generating price dislocations, which triggers even more orders and compounds the delays—a predicament that is only further exacerbated by the fragmentation of the equity markets. As this happens, stocks may trade outside of the NBBO briefly in millisecond or microsecond increments, constituting what I consider a genuine flash crash. All of this becomes a negative feedback loop that causes more volatility. Interestingly, if you define a flash crash by the percentage of executions that took place outside the NBBO, one of the largest ones occurred in 2008 after the first TARP bill failed, according to internal analysis we did a few years ago. And the market didn’t snap back, with the SPX closing down 10% on the day and on its lows. I think that may have been why there wasn’t talk of a “flash crash” afterward, but clearly the market structurally failed pretty badly that day, too. This suggests to me that, in a situation with actual bad news, the current US market structure may not be able to handle it, and there could be a downward spiral.